Dr. Andrew Cornett is a senior research engineer with Ocean, Coastal and River Engineering Portfolio of the National Research Council of Canada, and is also an adjunct professor in the Department of Civil Engineering of the University of Ottawa. 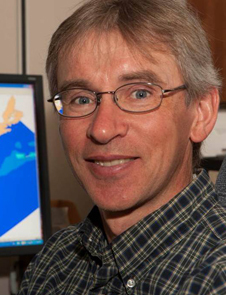 As Leader of NRC’s Marine Infrastructure, Energy and Water Resources Research Program, Dr.Cornett leads a multidisciplinary team of scientists, engineers and technologists conducting applied research and consultancy in the fields of coastal engineering, ocean engineering, water resources engineering, civil engineering hydraulics and water-driven renewable energy technologies. Dr. Cornett is a specialist in the application of physical hydraulic modelling, numerical modelling and engineering analysis to investigate and develop innovative solutions to a wide variety of problems in rivers, estuaries, oceans and coastal regions. He has contributed to the engineering design of many large international projects, including major ports, large offshore structures and extensive waterfront developments.